Stock liquidity is a term that is often used while analyzing which stocks to buy. Stock liquidity is a term that is often used while analyzing which stocks to buy. Similar has happened with Arun, who is new to stock market trading. He was learning the nitty-gritty of share market trading when his friend Vipul told him about stock liquidity. Vipul states that stock liquidity is the ability (ease) to buy or sell stocks without affecting the price. This means a stock that trades enough shares for the trader to sell it at any point in time is a liquid stock. "But how do we get to know if a stock is liquid or not,” Arun questions. If you have the same doubt as Arun, here are the few pointers Vipul gave him. Bid-ask spread is narrow: This happens when the bid (which is the highest price buyers are willing to pay) and ask (which is the lowest price sellers expect), have a small difference. This indicates there are more buyers interested to buy the stocks at the price which suits the sellers. Thus, a stock becomes liquid enough to sell at any point in time. Trade volume is high: When trade volumes are high, it indicates a higher number of shares are bought and sold on a given day. It is the high trade volume which depicts that the stock in demand has a large number of prospective buyers, thereby making it liquid. High trade volume during the high float: Float is the number of shares which are publicly owned and are available for trade. So, if the float is high, it means a higher number of shares are available for trading. However, it is important that the trade volume is high as well. A high trade volume during a high float ensures that the higher number of available shares are also being traded at a high rate, thereby ensuring liquidity. In an otherwise situation, where despite a high float if the trade volume remains low, it signifies that though shares are available for trading, buyers do not seem interested in buying them. This makes the stock illiquid. How does stock liquidity affect stock trading? Now that you have understood how a stock is liquid or illiquid, the next question you might probably have in your mind is, “How does this affect my trading?” When Arun asked the same question to Vipul, the latter explained how stock liquidity plays an important role in strategizing trade plans. If you are a long-term investor: If you are looking to make long-term investments and hold the stocks for a longer time, liquidity does not matter crucially. In fact, for long-term, experts advise looking at medium-volatile stocks to ensure lower risk. If you are a day trader: If you are into intra-day trading, liquidity matters you the most, especially when the time frame of the trade is short. 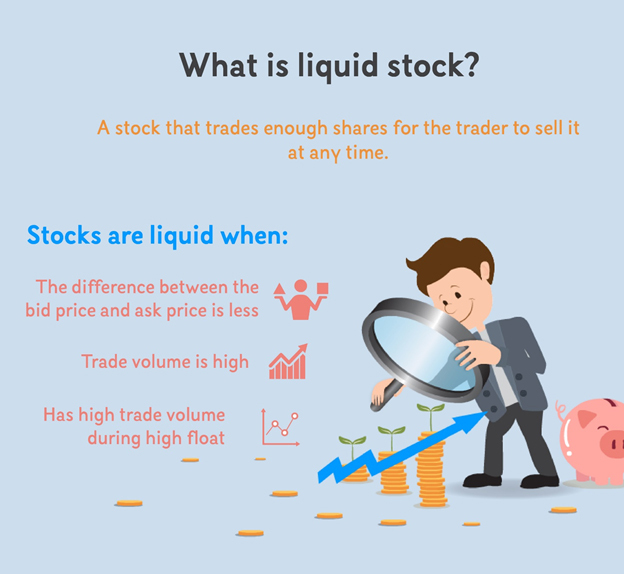 If you don’t want to hold your stock position for a long time, it is important that the stock you are trading is liquid. Liquidity is essential, especially for stop-loss. Otherwise, you might not be able to close your position easily. If you don’t want to take more risk: If you have a lower risk appetite, then you should not look for highly liquid stocks as they are highly volatile too. In such a situation, you should look for stocks which are liquid but are medium-volatile to ensure lower risk. This is how liquidity plays a vital role in strategizing your stock market game plan.